Courtyard garden at the begnning of the downunder Spring - just over two weeks ago. Really pleased with the length of time these pots of colour have been flowering. Petunias have now flowered since mid April - as have the nasturtiums, verbenas, pansies, violas and lobelia. Thanks all for your lovely comments - compared to this time last year, the courtyard is looking far more colourful. Thanks Arsh - we do spend a lot of time sitting out in the courtyard and relaxing. Looks like what I imagine the garden of eden to look like its beautiful. Unfortunately it's suffered a bit over the last two weeks, Morgana. I've been away visiting the grandkids and someone else has been doing their best to look after it ... but it's suffered (just not the same sort of love I'm afraid!) and to top it all off - we've had a duststorm raging over here for nearly a week now. Yes I have heard about the dust storm, terrible also a threat of a Tsunami in New Zealand back lash of the Samoa earth quake and Tsuna 8.3 earth quake. It will soon pick up now your back to care for it, no one looks after any thing as good as your self as you know what needs tending. Yes Morgana - Mother Nature has again been busy downunder with a few of her more spectacular events! I'll be spending the rest of the week cleaning my house - it's absolutely covered in dust from the duststorm and it hasn't cleared yet! Must be terrible to have these dust storms, especially with respirtory problems, hope you manage to get it clean, I know what it s like to have to clean such dust away, I use to work for a bookies called William Hill, they had an extention which created loads of dust, gets in every where. Tried cleaning today - but there's still so much dust being blown around ... it's useless! Will just have to wait until it's totally cleared away. The dust is a very fine red dust - we call it bull dust - from the outback. It's like fine talcum powder but an orangey red colour - very noticeable! Thanks for the tip - sounds like your Mum would know ... I'd imagine the houses of those families would be huge! Yes they were very large indeed. I will put a picture up for you to see one which belongs to Rothchilds my mum and her sister use to work for them, my cousin said she would nt like to have had to clean it and what work they had to do as it was her mother my aunty . Hi Bernieh, As always your courtyard is stunning. I hope the dust storms will be over soon. Sorry I’ve not been in touch lately I have had one crazy mad busy summer. Thanks Sueb - it's starting to heat up over here and while I was away on holidays down south I'm afraid the courtyard garden didn't do too well. Hopefully most of the plants will come back soon! Good to see you've popped in again! Actually we had a few cups out there today Floralhead! Thanks Annella - this was taken back at the beginning of our spring ... September ... and now as we head into summer, it becomes harder and harder to keep these lovely pots of colour going. This weekend I'll be re-planting some of them with hardier flowering plants such as torenias and calibrachoas. Thanks for your kind comment Bornagain ... 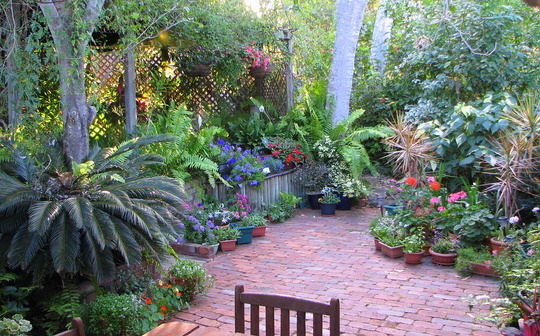 I'm looking forward to some different plants out in the courtyard this coming spring. Only just seen this - how stupendous it is - quite beautiful. wow,absolutly stuning what else can i say !